I strongly encourage my colleagues to submit manuscripts to me by email. Operads and Koszul duality, Course given during the GDO programme (Newton Institute, Cambrige, 2013). Methods for Koszul duality, Homotopy algebras, Deformation theory. Higher Algebra with Operads, British Mathematical Colloquim (Sheffield, 2013). algebraic operads and homotopical algebra respectively. Monoidal structures on the categories of quadratic data, with Yuri Ivanovich Manin, ArXiv:1902.03778 [38 pages]. The diagonal of the associahedra, with Naruki Masuda, Hugh Thomas, and Andy Tonks, ArXiv:1902.08059 [19 pages]. The twisting procedure, with Vladimir Dotsenko and Sergey Shadrin, ArXiv:1810.02941 [91 pages]. Symmetric homotopy theory of operads, with Malte Dehling, ArXiv:1503.02701 [40 pages]. Homotopy theory of homotopy algebras, ArXiv:1411.5533, to appear in the Annales de l'Institut Fourier. Volume 12, Issue 2, (2019), 463-535. Brown's moduli spaces of curves and the gravity operad, with Clément Dupont, Geometry &Topology, 21 (2017), no. 5, 2811–2850. Pre-Lie deformation theory, with Vladimir Dotsenko and Sergey Shadrin, Moscow Mathematical Journal, Volume 16, Issue 3 (2016) 505-543. Society, Volume 17, Issue 2 (2015), 535–547 [13 pages]. [survey article, 59 figures, 31 exercises]. Higher Koszul duality for associative algebras, with Vladimir Dotsenko, Glasgow Mathematical Journal, 55 (2013), 55-74. The minimal model of the Batalin-Vilkovisky operad, with Gabriel Drummond-Cole, Selecta Mathematica, Volume 19, Issue 1 (2013), 1-47. Advances in Mathematics, Volume 236 (2013), 224-256. Issue 3, Volume 6, 539-602. Journal für die reine und angewandte Mathematik (Crelles Journal), Issue 636 (2009), pages 125-174. Journal für die reine und angewandte Mathematik (Crelles Journal), Issue 634 (2009), pages 51-106. Free monoid in monoidal abelian categories, Applied Categorical Structures, 17, Issue 1 (2009), 43-61. Journal für die reine und angewandte Mathematik (Crelles Journal) Issue 620 (2008), pages 105-164. A Koszul duality for props, Trans. Amer. Math. Soc. 359 (2007), 4865-4943. Homology of generalized partition posets, Journal of Pure and Applied Algebra, Volume 208, Issue 2 (February 2007), 699-725. Pointed and multi-pointed partitions of type A and B, with Frédéric Chapoton, J. Algebraic Combin. 23 (2006), no. 4, 295-316. Koszul duality for PROPs, C.R.Acad.Sci Paris 338, 12 (July 2004), 909-914. In order to support public research, I now submit my articles only to (free) academic journals. My research works are 100% funded by public institutions; we edit and refer freely the research articles for publication, which often appear in electronic format. So there is no reason for the Government to pay high fees to private edition compagnies so that the mathematical community can have an acces to its own work. Propérades en Algèbre, Topologie, Géométrie et Physique Mathématique (June 2009), "Habilitation à diriger des recherches". Dualité de Koszul des PROPs (December 2003), Ph.D thesis, preprint IRMA. 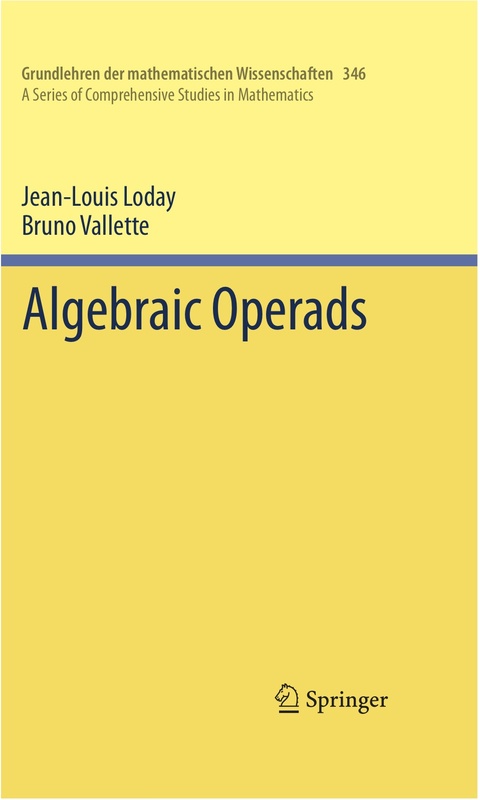 Opérades en Algèbre, Géométrie et Physique-Mathématique, Colloquium Algèbre-Géométrie-Logique (Université de Lyon, 2009). Homotopy Batalin-Vilkovisky algebras, Seminar on Algebra, Geometry and Physics (Manin seminar, MPIM, 2009). Deformation theory of algebraic structures, Second Congrès Canada-France (Montréal, June 2008). Deformation theory of morphisms, Trends in Noncommutative Geometry (Northwestern University, 18-24 May 2007). Joan Millès, maître de conférences (tenure position) at Toulouse University (since September 2011). Ph.D. thesis on "Algebras and Operads: cohomology, homotopy and Koszul duality" (defended June 3, 2010). Olivia Bellier, Teacher in Classes Prépartoires at Toulouse (since September 2013). Ph.D. thesis on "Algebraic and homotopical properties of operads on Hopf algebras" (defended October 16, 2012). Brice Legrignou, Postdoc at the University of Utrecht under the advisory of Ieke Moerdijk. Ph.D. thesis funded by the ENS Paris on "The homotopy theories of unital algebras and operads" (defended September 14, 2016). Malte Dehling, (Göttingen, unofficial coadvisor with Chenchang Zhu and Thomas Schick from September 2011). Ph.D student on the homotopy properties of Courant algebroids and on homotopy operads. Daniel Robert-Nicoud, Engineer UBS Zürich (since September 2018). Ricardo Campos, chargé de recherche (CNRS) at the University of Montpellier (since October 2018). Postdoc supported by a grant from the Swiss National Fund (2017-2018). Johan Leray, postdoctoral student from a grant DIM Math Innov, supervised with Gregory Ginot (2018-2019). Algebra, Geometry, Topology, and Mathematical Physics. You can find my curriculum vitae (February 2017) here. 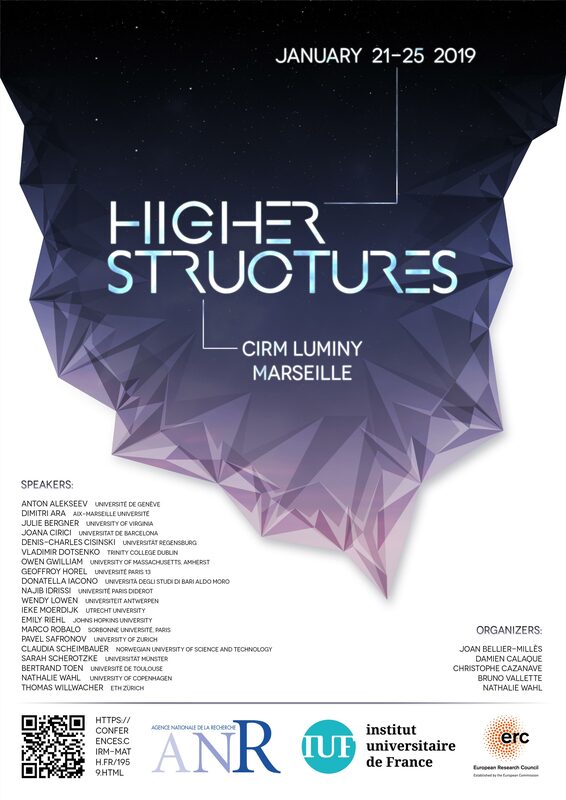 K-Theory, Cyclic Homology and Operads, a Conference on the occasion of Jean-Louis Loday's XXth birthday. 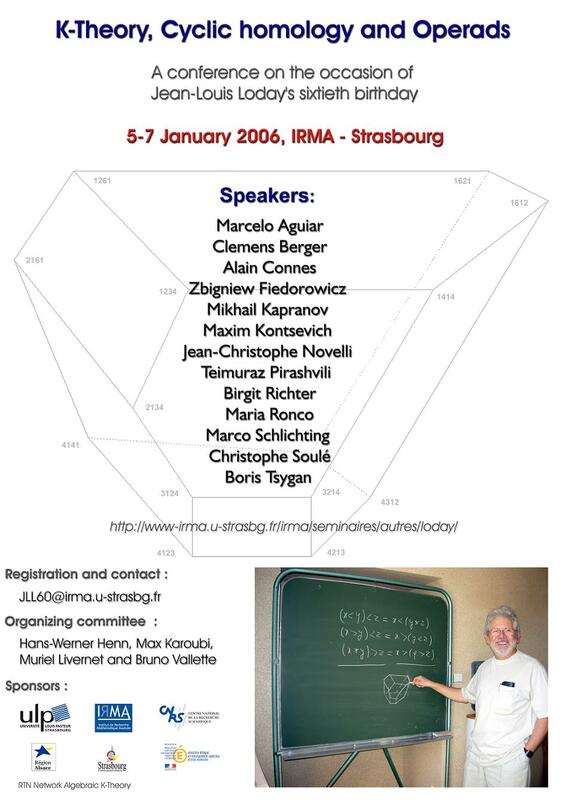 5-7 January 2006 IRMA Strasbourg (France), Website, Poster. Jean-Louis Loday, "Operads" Period [1993-2012], personal text dedicated to the memory of a giant gone far too early. Last update: March 12, 2019.